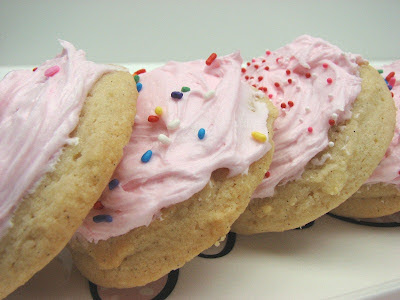 I have posted this sugar cookie recipe before but I just love it so much that I want to share it again. 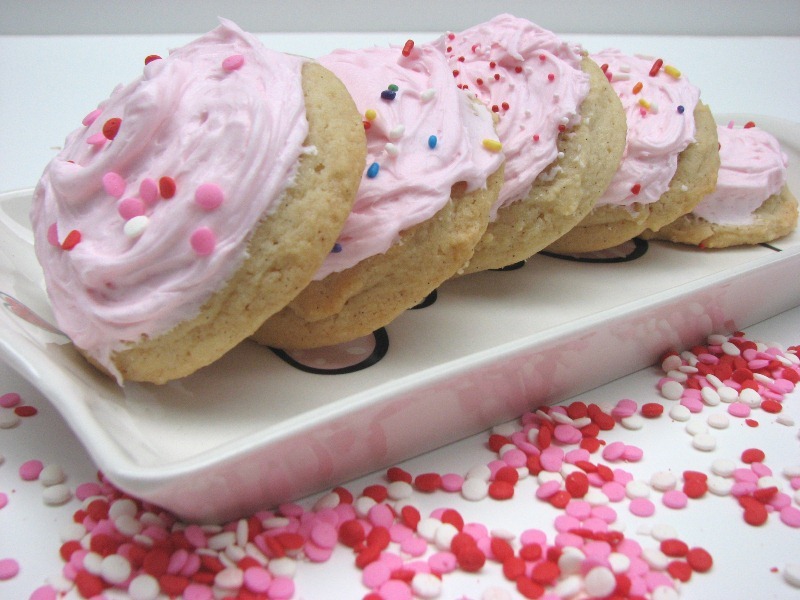 If you like thick, soft, cakey sugar cookies then you will love this recipe! The cookies are delicious on their own but with the icing they are absolutely excellent. I make these a couple of times a month and I always flavor my icing with a clear vanilla. I suppose you can use other flavors but I'm a vanilla girl. I sometimes will add some almond flavoring to the cookies but always in addition to the vanilla. This time I used a big fat moist vanilla bean and scraped every last seed out of it and added it to the cookie batter. I also added a hefty splash of vanilla extract. For the icing I use a simple American Buttercream - butter, powdered sugar, milk, flavoring, pinch of salt. I have to let the cookie sit for a few hours after I ice them so the frosting developes kind of a crust. That way I can stack them easier. I make sure to put a piece of wax paper in between each layer. As you can see from my photos, I do NOT skimp on the icing. I like a big thick layer on my cookies so my teeth sink through the sugary vanilla-y smooth goodness before hitting the soft vanilla cookie. These cookie may look time consuming but they aren't. Actually, the icing of the cookies takes longer than the cookie baking part. I do not chill the cookie dough after I mix it although the orinigal recipe suggests it. I use a cookie scoop and place the balls of dough onto a parchment lined cookie sheet. I do not flatten the cookies either because I want them to remain thick. I make certain to take the cookies out of the oven before they turn golden on the edges. If they stay in too long, they are not as soft. They feel slightly underdone right after I remove them from the oven. Don't worry, they will cool and set up nicely although they still are somewhat fragile after they cool. These are ultra soft! These are big time comfort food for me! I love them almost as much as chocolate chip cookies. Mix dry ingredients in a bowl ; set aside. In a separate bowl, combine butter, sugar, eggs, and vanilla (or another extract like almond). Beat until mixed well. Add the dry ingredients slowly. Mix until combined. Either scoop balls of dough with a cookie scoop or roll balls of dough and place on parchment lined cookie sheet. Bake 10-15 mins (time depends on size so start with 10 minutes & watch closely)or until just the edges of cookies start to turn a very, very light golden brown. Don’t over-bake. For an extra-doughy consistency, remove the cookies before the edges start to brown..
Heidi: Thanks for the recipe! I am going to attempt to recreate these wonderful looking cookies tonight. Question: How many cookies does this recipe yield? 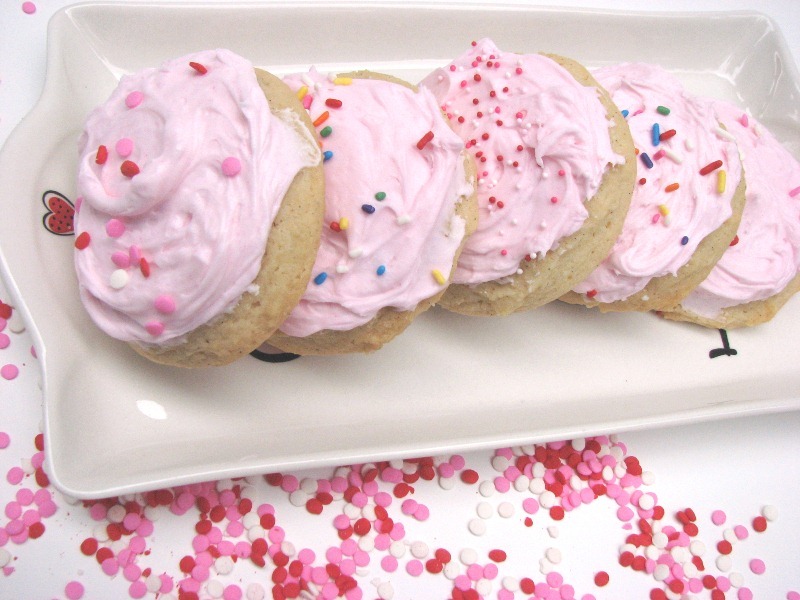 This is one of my favorite cookie recipes and I make it regularly. I like to make the icing a different color each time and use different sprinkles. I never get sick of making (and eating!) these cookies. The amount of cookies this recipe will make is totally dependant on how big you make your cookies. I'd say if you make your cookies an average size, say 3", then you should get about 3 dozen. That's just a guess. Sometimes I make mine tiny, like 1.5" but sometimes I make them very large, like 5". The bigger your cookie, the softer it is. The little ones cook all the way through so they are not as soft. They are tender and a little more crumbly. The very large ones are very soft, almost squishy and cake like. Yum, that's my favorite. Oh, another thing, I always add a lot more flavor than the recipe calls for. I probably double, if not triple my extract. Usually it's vanilla extract with a hint of almond. Almond is such a strong flavor that I use just a dash of it but I use a LOT of vanilla. Or I have an extract that is vanilla/butter. That's a good one! Good luck! let me know how your cookies turn out!